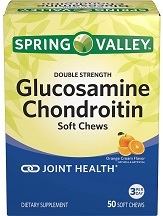 Spring Valley Glucosamine and Chondroitin Soft Chews provides nutritional support for cartilage and connective tissue, promoting joint health and comfort. The goal of this product is to help people living with joint pain and struggling to perform daily activities. To know more about this product, continue reading the complete review. Glucosamine soft chews are easy to swallow and have no artificial preservatives, no gluten, yeast or wheat. The manufacturer recommends taking three (3) soft chews daily, or as recommended by a physician. The chews may be taken all at once or taken throughout the day. One pack containing 50 soft chews costs $10.88 in walmart. You can also avail free shipping on orders over $50. You can get this product from Amazon at a cost of $18.59. There was no major side effects for this product stated in the product label or in the manufacturer’s website, at the time of writing this review. The manufacturer advises to contact your doctor before use of this supplement. The manufacturer warns that this product contains milk and soy, so it may cause allergies in some people. It is also manufactured on equipment used to process dairy, peanut, almond, walnut, pecan, nutmeg, soy protein and wheat products. If pregnant, nursing or taking medications, you must consult your healthcare professional before taking this product. A money-back guarantee from the manufacturer was not found, at the time of writing this review. Most buyers would prefer a money back guarantee as an assurance that if they don’t get the results that they are looking for, they will not lose the money they spent for this product. Depending on which retailer you buy product, the refund or return policy may vary. When you purchase this product from walmart and if you are not satisfied with this product, you can return it within 90 days from the date of purchase. This product had garnered many positive reviews. Spring Valley Glucosamine & Chondroitin is an effective supplement for joint support. It provides double strength to help rebuild cartilage and lubricate joints. There are several positive reviews for this product, which is a proof that this product works. Although, you may avail refund or return guarantee from the retailers you may buy, the manufacturer has not offered any money back guarantee. This can be a disadvantage to the product, because some buyers would not be willing to take the risk without a refund guarantee. It may cause allergies in some people because it is manufactured on equipment used to process dairy, peanut, almond, walnut, pecan, nutmeg, soy protein and wheat products and it also contains milk and soy. The online purchase options for this product was pretty much limited to only few retailers.